I've always had the desire to work with my hands, though I hadn't really given myself the opportunity until recently. Partly inspired by the resurgence of DIY, and partly by the budding craft movement, I've begun to pick up a range of new skills. Over the last year, I reintroduced myself to the sewing machine, taught myself crochet, learned block printing, got into baking & soupmaking, and got acquainted with street tree bed gardening. Tonight, I added a new skill - jewelry making. 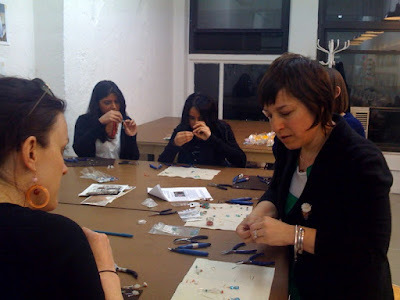 Through make workshop (run by sewing guru Diana Rupp), I learned the art of earring assemblage from Deb Stein of Bonbon Oiseau. Deb is super down to earth and seriously encouraging of her students. She'll be teaching another class in memento assemblage with bracelets and necklaces next month (details). Deb makes it a point to use ethically sourced materials -- like antique beads -- in her jewelry line, which is made at her studio in Greenpoint, Brooklyn. Her beautiful baubles are available in the US, Europe, and Japan (she's especially popular there). Deb will also be at the Brooklyn Flea for its Spring re-opening this weekend. She's also designing jewelry for the Brooklyn Botanic Garden's Cherry Blossom Festival. I walked away from class with two pairs of dangly earrings and a new skill to add to my DIY bag of tricks. Attention conscious consumers: Shop at Peaceful Valley between now and April 25th and you'll be doing something good for your health (and the planet). For Earth Day, this eco-friendly e-tailer will plant 10 trees in your honor when you purchase from their shop. Some of the great stuff they sell: organic cotton clothing, tree-free greeting cards, earth-friendly jewelry, natural beauty products, organic treats, and so much more! 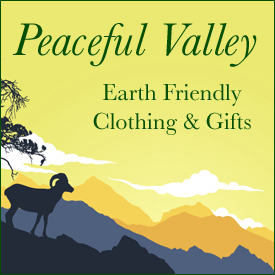 Shop Peaceful Valley Earth Friendly Clothing & Gifts - for the trees, for the planet, for peace.